These are for Service to Cordwalles beyond the call of duty. These are for boys who have shown personal growth and achievement throughout the year. Nathan Daniel Continued all-round effort and determination. Hayden Holt Perseverance and enthusiasm. Andiswa Thwala Quiet determination and personal growth. David Colenbrander Progress and perseverance in Mathematics. Mholi Khuzwayo Enthusiasm and positive attitude. John Gilson Outstanding work ethic and effort in the classroom. Tahil Nankan Continued all-round effort and determination. Jamie Wessels Personal growth and perseverance in the classroom. Syun Maharaj Continued perseverance in the classroom and respectful behaviour. Langelihle Myeza Continued all-round effort and determination. Alexander Roberts Consistent effort in all subjects. Lwandle Gabuza Outstanding work ethic. Nathan Koller Strong leadership and enthusiasm in the classroom. Jordan Fryer-Dudley Personal growth and perseverance. Langelihle Dlamini Consistent effort and outstanding work presentation. Ethan Clark Consistent effort and determination. Oliver Gray Perseverance and enthusiasm. Ntando Nyabonda Diligence and outstanding work ethic. Harry Vickery Commitment and determination. Thomas Mason Personal growth and endeavour. Luke Mitchell Continued all-round effort and determination. Marc Isabelle Diligence and personal growth. Yahya Hansrod Perseverance and personal growth. Jason Peddie Consistent effort and determination. Franko Bocking Outstanding work ethic. Brackyn Middleton Focus, tenacity and determination. Brendon Barnard Consistent work ethic and quiet determination. Jared Wilson Improved academic achievement and determination. Kuhle Phungula Consistent work ethic and application. Joaquim Abreu Consistent work ethic and determination. Benjamin Bryden Consistent pursuit of excellence. Oscar Steiner Consistent pursuit of excellence. Sithenkosi Nkompela Determination to achieve his best at all time. Andrew Boettiger Determination to succeed. Ewan Du Plooy Determination in academics and personal growth. 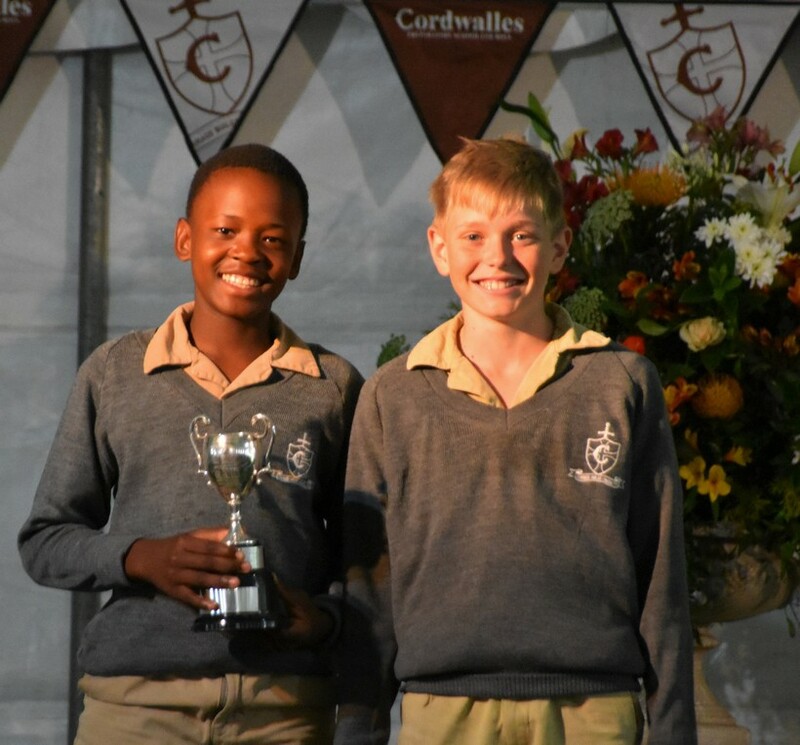 Siyamkela Maphumulo Continued perseverance in the classroom and respectful behaviour. Kayden Naidoo Quiet determination and personal growth. Joel Kempthorne Perseverance, personal growth and determination. Cuan Conway Perseverance and enthusiasm in the classroom. Jordan Benians A positive attitude and personal growth. Blake Chittenden Enthusiasm and a positive attitude. Martin Lazarov Consistent work ethic and application. Luke Marshall Perseverance and personal growth. Matt Mason Consistent work ethic and application. Tristan Reeves Perseverance and personal growth. Tristan Ardé Perseverance and grit in the classroom and on the sports field. Olivier Gaboreau Perseverance in the classroom and excellent manners. James Hendry Consistent all-round effort and determination. Yanga Ndamase Perseverance and personal growth. Ahmed Noorgat Enthusiasm and a positive attitude. Huntley Price Moor Perseverance and grit in the classroom and a love for nature. Luke Reynolds Perseverance in the classroom and grit on the sports field. Polite, well-mannered gentleman and perseverance in the classroom. Continued all-round effort and determination. Quiet determination and personal growth. Improved academic achievement and determination. Consistent work ethic and determination. Personal growth and perseverance in the classroom. Library Certificates-Awarded to the boy who has read most consistently during the year. We call on Luke Reynolds to come up and hand over the Bill Dixon Smith award for the most improved cricketer of the year. Bill Dixon Smith was a Cordwalles and Michaelhouse old boy. He is also the grandfather of Luke Reynolds. Luke is the 4th generation of Reynolds to attend Cordwalles and the 2nd generation on the Dixon Smith side of the family. He was head of Founders House and he received honours for both rugby and cricket. In addition to his sporting ability Bill was also Head Chorister at Michaelhouse and took lead roles in many plays. INTERHOUSE TROPHIES Would the captains of the winning team please come up to receive the trophy.